The Curiosity Rover looks head-on at the camera in this stunning self-portrait taken on Sept. 7, or Sol 32 (the rover's 32nd day on Mars). Curiosity, a car-size rover that landed on the Red Planet last month, is searching for signs that life could have ever survived there. In between chemistry and geology experiments, Curiosity captured its own image with its Mars Hand Lens Imager (MAHLI). 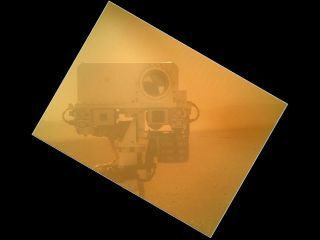 MAHLI is a focusable color camera attached to a turret of instruments at the end of the 7-foot (2.1 meters) arm on Curiosity. The image was taken as part of in an inspection to test the tools and cameras on the rover's arm. The photo looks hazy because the dust cover on MAHLI was closed at the time. The $2.5 billion Curiosity rover is beginning a two-year mission to explore Mars' Gale Crater. The 1-ton rover carries 10 science instruments to determine if Mars was ever, or is now, capable of supporting primitive microbial life.